A frequent C-suite member and consultant with some of the largest telecommunications companies in the world, visionary Benjamin Von Seeger reflects on nearly twenty years in business while focusing on how to develop the innate business acumen and strategic tactics that can mean the difference between commercial failure and towering achievement. Not your father’s how-to business guide, “The RiVal” digs deep into the essential elements of global business leadership — including emotional and relational intelligence, relationship-building, brand development, business strategy, understanding global competitiveness, and much more — so that readers can immediately apply these principles to their everyday professional lives, whether starting-up, or breathing new life into an existing business venture. Earning the Editor’s Choice and Rising Star award from publisher iUniverse, “The RiVal” is definitive guide to being a good sales executive and global business leader, as well as establishing and retaining a successful business. Benjamin Von Seeger speaks from the rare vantage point of multiple and towering success stories. Serving as a Vice President at Terremark Worldwide Inc. (AMEX:TMRK), NAP of the Americas, he secured multimillions in contracts from the largest national and international telecommunication carriers, content providers and other major corporations based in Latin America, Europe, Asia and the U.S. The company was later sold to Verizon for $1.4B USD. A driver of innovation, Benjamin Von Seeger was also the Director, Global Markets with CENX, the world’s first carrier Ethernet exchange. Today, while managing his own enterprise BVS Consulting Group, he also serves as a Partner for Leapfactor Inc. and global business consultant to several global organizations. Von Seeger has built and led sales teams that have consistently and exponentially increased revenue and profit. Von Seeger is based in Miami, FL. BVS Publishing is a division of BVS Consulting, a boutique technology consultancy firm for companies looking to accelerate growth with partnerships in international networks, hosting services, data centers, managed services, application and content delivery services. 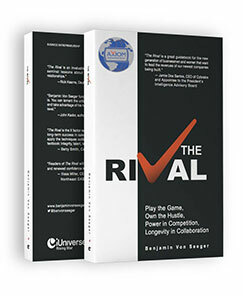 For more information about author Benjamin Von Seeger and his book, “The RiVal,” please visit: www.benjaminvonseeger.com, LinkedIn, Facebook, or follow him on Twitter: @benvonseeger. “The Rival” is now available for purchase on Amazon, iTunes, and www.worldcat.org.